Saw this quilt in a show. I love a good puzzle but can't figure out how this one goes together. Does anyone know the name of this pattern or link to a site that can solve this puzzle. I think it would be fun to make and let others try and figure the pattern out. I'll be watching- I can't figure it out. There must be some partial seaming, but...wow...don't have a clue! Looks like a lot of Y seams to me. A bigger picture would be useful though. I would guess so, too. It's hand quilted so I'll bet it's hand pieced as well. The fabrics look very old to me. There are no signs of seams in the blocks. It would have to be done with partial seams or splitting the large blocks in half or quarters. I think it is a disappearing Nine Patch pattern too. Do not have a clue as to the name. I agree - there are no visible seams in the larger blocks - in order to accomplish that, you would do the partial y seams. Way to many for me - it might be better to do it with hand piecing. It does look similar but I don't think it's the exact pattern unless it's a variation. I don't think anyone would do all those set in seams for a simple square block pattern. Partial seams, unless you can detect seams through the print blocks (I can't see any in the picture). Last edited by krafty14; 05-24-2013 at 12:41 PM. I think the fabric is Liberty of London's Lifestyle line - I got some bricks in a swap, and loooooove them! It's a nine patch. Even tho this doesn't show seams. go here and you can see the seams of the nine patch blocks. You would need a design board to make this. Patterns like that can make aperson crazy trying to figure it out, huh? I bought a bedspread quilt one time and never did figure out how it went together. Someone posted and asked if there was a pattern for the quilt. I think it's a bunch of Y seams too. No seams in the big blocks as far as I can tell, so it's not a D9P or a strip block. I laid a tile floor in this pattern once but this would be way too many Y seams for me to make into a quilt! The Xanadu quilt looks similar to the original one posted, but the original one does not appear to have any seams in the large blocks. The Xanadu quilt appears to be 2 2-1/2*4-1/2" blocks pieced together to create the illusion of being one single 4" finished block. This could easily be done by cutting a jelly roll into pieces. The other possibility for the original quilt is that it was done using English Paper Piecing with 2" and 4" paper squares. 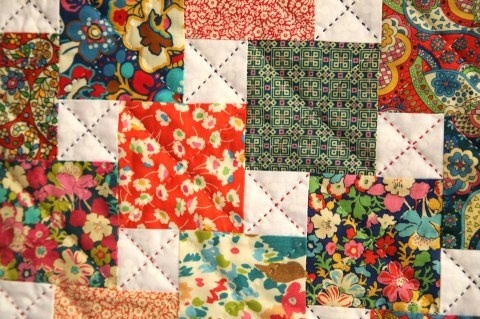 Since the original quilt does not seem to have more than one solid piece creating the large block, I would bet that it was made using EPP. You can buy this pattern "Xanadu" at Virginia Quilter (see link above from Sewnoma's post) for $9.99. No y seams and is classified as "easy". Not a D9P, and I think it is not small squares or strips either. A day or two ago I saw a tute on how to make a basket weave. Lots of partial seams, but the results were stunning. It looks like they took a 3 inch square and sewed a 1.5 inch square to it and then sewed another 3 inch square. WOW, lots of work on this block !